Awww, aren't you a cute little Voldemort impersonator. Aww, and look at that, he belched. These things are adorable. 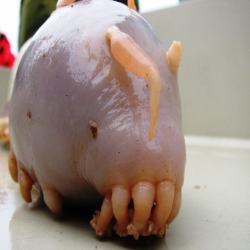 Ugly Cute is what happens when a creature that isn't exactly "attractive" somehow manages to be adorable. Normally, these little guys still have some kind of stereotypical "cute" traits, like oversized eyes or a fat little body. And then, there's these guys. They're scary, and meant to be... and they still, somehow, manage to be adorable. These little guys may sport Cute Little Fangs, be Mooks for the resident Big Bad, or hail from a Halloween Town-flavored setting. Compare and contrast Ugly Cute and Killer Rabbit. May overlap with either Adorable Evil Minions or Creepy Good. See also Gonk. Ciel from Black Butler is your typical Creepy Child yet many find him to be cute. Undertaker is one of the creepiest characters in the series. He's also one of the most endearing, and he has many fangirls who find him adorable. Danganronpa 3 has Seiko Kimura. A tall woman with Wide Eyes and Shrunken Irises, who speaks in Creepy Monotone and wears a mask over her mouth. Nonetheless, she is loved by the fans, who deem her design adorable and especially her younger versions are absolutely adorable. Neferpitou from Hunter × Hunter. Adorably catlike, yet we see them play with the dead heads of their victims and turn dead people into puppets. Also the fact that they're well... evil. Their design itself could even count as cute in a scary way. Kukuru from Joshiraku is this during her more sane moments. What fangirls think of Dr. Stein from Soul Eater. It's also the main reason his younger self is a One-Scene Wonder. To say nothing of Crona. And Medusa when in possession of Rachel. Either Russia or Belarus from Axis Powers Hetalia, depending on the fans you're talking to. In Marginal #4, adorable Idol Singer twins L and R pretend to be possessed by demons on a hidden camera show. This is the result. Shino Aburame from Naruto; like all the Aburame, his body is a hive for mutualistic beetles, but he's one of the good guys and sulks when people forget him. Taken Up to Eleven in fan-works. Orochimaru and Nagato when they were younger also count, considering both would grow to be well...less than friendly characters the two qualified here tragically. Shouko from Baka and Test: Summon the Beasts. Her crush on Yuuji and her ways to come on to him is downright creepy, but you can't deny that she is pretty cute. Juvia Lockser from Fairy Tail is this a lot during the series. The creepy part of her is usually when she's calm or insulted by the cast, but whenever she's around Gray her adorable side comes out in the form of infatuation which sadly gets ignored most of the time. The titular Franken Fran is an assembled corpse girl complete with a stitched together Glasgow Grin. Even after seeing what happens to most of her patients one can't help but feel endeared by her positive outlook and adorable personality. In Pokémon, some of Team Rocket's Pokémon can count as this. Of particular note is Jessie's Pumpkaboo/Gourgeist in the XY series. Tomoko Kuroki from No Matter How I Look at It, It's You Guys' Fault I'm Not Popular! is this out of awkwardness and shyness. Though she tries to be Creepy Awesome by proving, she can handle people (which she fails a lot at by the way). Her jealous and deranged inner self, comes off more adorable than anything truly malevolent. Jo Jos Bizarre Adventure Vento Aureo has Pannacotta Fugo's Stand, Purple Haze. It's a violent, uncontrollable Stand with the ability to release a deadly flesh-eating virus, inflicting a quick and painful death to everyone around it and making its user into The Dreaded among bad guys. It's also obsessed with cleanliness, and sometimes tries to rub dirt off itself, making it oddly endearing despite being one of the most dangerous Stands in the entire manga. Nightcrawler from X-Men, and his animated incarnations. He physically resembles a demon, but he has this fun-loving personality that is hard not to love. In Runaways, Old Lace is a Deinonychus who's fully capable of ripping someone to shreds, but her original depiction, with her big eyes and lanky body, makes her so endearing. Curtis and Erik from Creature Feature. Despite being cannibalistic and the former is a werewolf and sometimes reanimate the dead, the two are fun-loving Perky Goths, and it's adorable. Dani is also this when she's not in her Stalker with a Crush mode. Max of Sam & Max: Freelance Police is a three-foot-tall, hyperkinetic rabbity thing with white fur, big ears and feet, cute little beady eyes on either side of his wide head, and a big mouth filled with sharp, shark-like teeth. My Little Pony: Friendship Is Magic fan fictions that are meant to be horrifying or gory can fall squarely into this territory instead. It's just the effect that, say, a serial killer who happens to be an adorable pastel-colored little pony named Cookie Crumble can have. Badumsquish, when he's not making the weirdest damned NSFW stuff you ever saw, has turned out some very strange creations that fall squarely into this territory. It probably helps that he is a My Little Pony: Friendship Is Magic fan artist whose style is almost identical to the show. So far he's made a bed bug, a stomach parasite, and a sentient hive-minded mass of naughty tentacles that have infested a pony costume named Cuddlhu all adorable. The latter is an intentional example, which comes with a story where "she" is basically The Woobie that only wants companionship. A kid Nui from Maim de Maim may not look creepy, however, she is this in terms of her behavior (the whole entire "violence is normal" and being sadistic thing) , until she skinned a girl alive that is. In Critters, the title critters are little balls of fur with big eyes... and teeth that would make a shark feel insecure. Tim Burton's (and Henry Selick's, for that matter) stop-motion films would certainly count. Case in point: Sparky from Frankenweenie, a bull-terrier who's been stitched together and brought back to life via electricity after getting killed by a car. Hotel Transylvania. She's 118, can turn into a bat (albeit a very adorable one), crawl on walls, can't go out during the day, and has no reflection, but otherwise, young Mavis appears to be a normal, sweet teenage girl. Men in Black: "Congratulations, Reg, it's a ... squid." The Fourth Doctor from Doctor Who was intended as this. Gothic Horror tropes? Nightmare Fetishist? Cheshire Cat Grin? Creepy Blue Eyes? All yes. Genius Sweet Tooth Manchild with Immortal Immaturity, cheeky little Character Tics, an unreserved love of gothic horror stuff and Innocent Blue Eyes? Also all yes. Tom Baker, when asked to describe his Doctor in one word, said "adorable". Steven Moffat pointed out that the Fourth Doctor is one of the most scary, difficult-to-handle Doctors of the lot. Terrance Dicks felt that he was the Doctor (out of the first five) most likely to turn towards evil. It isn't mutually exclusive. Daleks. Horrifying space racists and the most evil creatures in the universe, but due to being rather short with stubby 'arms', just anthropomorphic enough in movements and mannerisms to feel endearing, occasionally written as The Grotesque or even The Woobie and sometimes even a bit wobbly thanks to Special Effect Failure, they can be adorable. "The Space Museum" has a Dalek in it that Vicki finds cute (much to the disgust of her companions). The Human Factor Daleks in "Evil of the Daleks" act like small children, chase each other around, play 'trains' (with the Doctor supplying a train whistle sound on his recorder) and 'Dizzy Doctor' (where they spin the Doctor around until he gets dizzy), and have much gentler voices with a lot more expression. The tea-making "Ironside" in "Victory of the Daleks" is positively adorable. Young, pre-supervillainy Ed Nygma in Gotham. On the one hand, eccentrically adorkable and reasonably good-looking in a nerdy sort of way. On the other, even before his Sanity Slippage he's a Nightmare Fetishist with boundary issues. Parker from Leverage is a very pretty, quirky young woman who believes in Santa, and is also something of a Woobie thanks to her Dark and Troubled Past. She's also one of the more ruthless team members and has a penchant for saying disturbing things. Place the mask over your mouth and nose and breathe normally. In the event of a water landing your seat cushion can be used as a flotation device. But, let's face it, if this thing goes down in the water, more than likely the impact will kill you. Please take a moment to locate the nearest emergency exits because if this plane's on fire you're gonna wanna get out quick. Jet fuel burns at over 1000 degrees. That's hot, folks! Made Out of Babies' "Sugar". 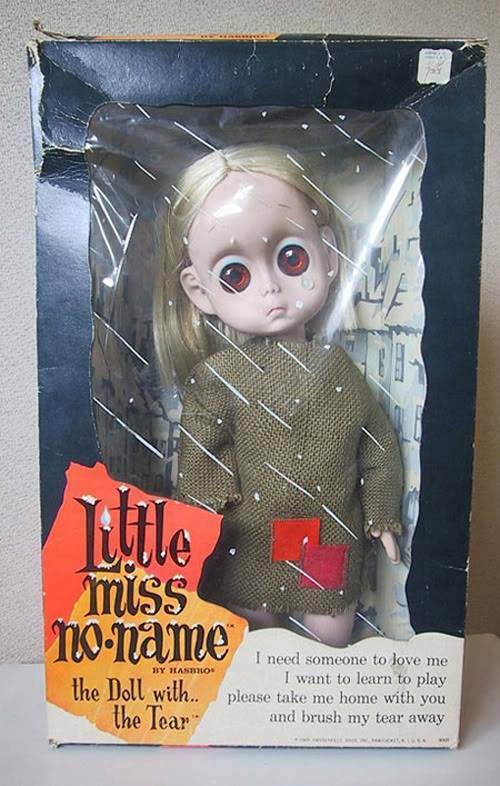 Little Miss No Name ◊ is an example where the "creepy" part was unintentional. This Hasbro doll was intended as an object of pity and compassion for little girls, as opposed to the vast majority of dolls which were mostly based around Wish Fulfillment. However, the empty soul-staring eyes of the doll made most children more terrified of it than anything else. You will find quite a few adults, however, who do find Little Miss No Name cute. 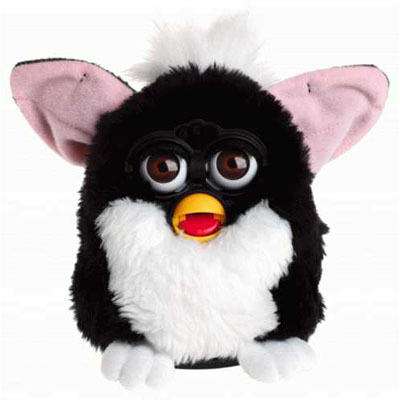 Furbies, particularly the original versions ◊ from the 90's. Prior to their being given digital eyes and more developed animation circuitry. Tonberries from the Final Fantasy franchise. See an example of their behavior. They're tiny little critters, who don't attack first. Instead, they wait. And wait. And wait for you to attack and give it your best shot, creeping closer until they stab you with their knives. And yet, their small size (usually, though even the big ones are cute), big eyes, and reptilian features rather than being a scary point, is downright adorable. The Save-Moogle on the world map of Final Fantasy IX: while he acts like a normal Moogle usually, if you call and dismiss him over and over again, he starts to get annoyed, then angry, and then (eventually) threateningly states "I'm sharpening my knife, kupo..."
Boos of the Mario series. They're roundish little Bedsheet Ghosts with a mouthful of fangs and beady eyes. They also stick their tongues out like Bratty Half Pints, and let out a hilariously high-pitched cackle when they spot you. The Witch from Left 4 Dead, who was intended as the scariest zombie of them all, but receives a lot of love and fanart from the base. Creepers from Minecraft. They look like screaming zombie cacti, but they're pretty much the game's mascot. You can even buy Creeper plushies that go "SSSSSSSSSSSS" when you squeeze them. Flandre Scarlet from Touhou, who is a cute girl with crystalline wings, and also a mentally unstable vampire and a Person of Mass Destruction who has a high chance of blowing you to smithereens without even trying. MapleStory: Zombie Mushrooms, Death Teddies, heck, half the undead creatures qualify as do the aliens. Particularly unsettling in the case of the Death Teddies; they're built in a factory that specializes in animated plush toys, and robots seem to be assigned to work on this project. At the lower levels, one can assume that such toys have been discarded due to their beat up appearance, and whatever animated them has warped the toys horribly turning them into undead monsters. Let this sink in for awhile, then look at how cute these things still are despite having giant ghosts on their back. BlazBlue has Taokaka (and the other Kaka, especially the kittens); Personality-wise she's your typical Genki Girl Cat Girl, who just happens to wear a hood with only glowing eyes and More Teeth than the Osmond Family visible. Carl Clover might also count as an In-Universe example, since he's an adorable preteen boy (in the flashbacks, Makoto had a habit of hugging him) with a great deal of Troubling Unchildlike Behaviour. Ghost-types from Pokémon are supposed to be scary or at least unsettling in-universe, but a lot of the unevolved forms appear to be Ridiculously Cute Critters. Such examples include Misdreavus, Shuppet, Duskull, Drifloon, Litwick, Phantump and Pumpkaboo. Hydreigon is a three-headed dragon Pokemon that's specifically noted by the Pokedex as being scary looking, which is rather hard to deny, with it sporting two prominent pairs of fangs, huge black and red eyes on its main head, and spiky-looking frills on each head. However, it still manages to be strangely adorable, particularly when it smiles and does happy dances . Mimikyu is some sort of horrifying abomination that is so awful to look upon that researchers pass out from the shock, with a true form of which only glimpses are shown (of long, shadowy arms and a horrific cackling voice). This is because it spends its whole life wearing an amateurish Pikachu costume in the hope that people will love it. The Poes from The Legend of Zelda: Ocarina of Time. They're ghosts who are pretty malevolent, but they have an adorable, high-pitched cackle, much like the Boos. Also like Boos, their laugh is a sped up version of the final boss's laugh. The animatronics from Five Nights at Freddy's. Once you get desensitised enough to their Jump Scare tactics, and find the in-game hints about what they actually are, it's hard not to feel a bit sorry for them. The most extreme example is probably the 'Freddles' from Five Nights at Freddy's 4, which are tiny, creepy wobbling plush toys with many sharp teeth and Glowing Eyes of Doom... But they're so adorable. another example from the same game would be Plushtrap who is basically a baby version of Springtrap. Bebedora from the third Arc the Lad game, known as Twilight of the Spirits. She's a child-like monster whose face is never revealed beneath her hat, and who calls on the powers of darkness to possess and control enemies—-but who also has a child's curiousity and affinity for play. Her weapons are stuffed animals with which she slaps the enemy. Pretty much all the ghosts Luigi's Mansion: Dark Moon are this. The Giant Spider that serves as the first Boss is kind of Creepy Cute too once it is freed from Demonic Possession. The infamous, Blizzeta boss battle from Twilight Princess so sweet, so cute...so freaky. Many creatures and even some of the playable characters of Don't Starve fall under this, but special mention goes to omnipresent spiders which are frightening and surprisingly hostile to whoever happens to pass close to their dens at dusk, but are at the same time terribly cute, especially performing their "cower" animation ◊ in fear of being struck back... and speaking of spiders, the playable character that best exemplifies the "Creepy Cute" part of them must be Webber: at first glance he looks like a terrifying humanoid spider, with legs coming out of his head and a mouth full of fangs... but then when he speaks you realize he's a young boy trapped inside a spider in a weird symbiotic relationship. He shows a lot of curiosity and uses childish terms for many things. In TRI: Of Friendship and Madness, you'll almost never run into another living creature within the Odd Gods' World - well, until you get to the Prisons chapter. Lurking inside breakable pots in a single room are little four-legged 'Eye Bug' creatures which might be startling to some - they resemble spiders, and as their name suggests, have one big eye in the center of their head. They're actually harmless, and you'll have to make use of them to solve a puzzle. Several monsters in Undertale qualify, but Muffet stands out. Aww, what a cute spider girl! Who wants to eat you! This critter ◊ from Myst V: End of Ages qualifies, mostly because of the cute honking sounds it makes and its silly way of walking. The antagonists of One Night at Flumpty's tend to be rather silly and adorable when roaming around the building, and not drastically changing their face when attacking you. Special mention goes to Flumpty, who even does a mocking "peekaboo" before draining your exposure meter in the sequel. The Little Sisters from Bio Shock are five year old little girls in cute dresses who just want to run around play. They also have glowing eyes, have not had a bath in quite a while, and drink blood from corpses. (Saving or killing them is a gameplay mechanic) The Little Sisters and their protectors (the Big Daddies, specifically the Bouncer type) are Series Mascot . Most players of Tattletail will agree that the main Tattletail is adorable despite being somewhat creepy. Notably, Sr. Pelo suffered from Cuteness Proximity upon seeing him for the first time! Some Half-Life enemies tend to be seen as cute by fans when they are not trying to reduce you to a bloody pulp. Some of the most notable examples are the Houndeyes and the Bullsquids. Kistrel in Neverwinter Nights 2. You encounter him a cave and he's alone, shy and hungry. If you feed him with some insect you found earlier, he'll warm up to you and even knit you a nice magical cape. That's the cute part. The creepy part? He's a Giant Spider! M4 SOPMOD II from Girls' Frontline combines this trope with Cute and Psycho. On one hand, she's rather bloodthirsty, collects limbs from Sangvis Ferri gynoids and wears them, along with quite a bit of black clothing. On the other hand, she's very affectionate towards the Commander, acts as The Heart for AR Team and otherwise looks like a pretty girl with light pink hair and pinkish-red eyes. She gets a lot of fanart and is often nicknamed "Soppo". From Phoenix Wright: Ace Attorney - Trials and Tribulations, we have Viola Cadaverini, a young woman who is not only cute and pretty, but also very creepy. The Blue Badger, anyone? Seems to be more of a Nightmare Fuel in-universe. her cute part is intermittent though. The developer of the visual novel Love At First Sight has actually chosen the name Creepy Cute. In fact the love interest from this game can be also considered that, being a Cyclops... but this is mostly a gimmick because it's a very standard romance. The art style of the whole game is also creepy but cute according to several gamers. All of the love interests in Starstruck Love will fall under this at some point, particularly in the Extreme Love End. The monsters from Yet Another Fantasy Gamer Comic are more Ugly Cute than they are this. With the possible exception of Jone . In Drowtales, drowolath may see demons this way. Especially Discordia and the second glutton (megaspoiler ). Gunnerkrigg Court frequently employs this as an art style. Even on its donation page . Trying Human has Hue, a Grey alien that manages to be SO ADORABLE and yet is meant to be creepy. Also, most notably, the Reptoids. Meant to be human-eating lizard monsters, but come on, they are so freaking cute, especially Quazky. Reptoids come complete with Cute Little Fangs, which are meant to look evil, but somehow manage not to. At all. Your average Trying Human reptoids, in all their adorableness. Many, many creatures of Zoophobia come off as this. Take Perci ◊, for example. This trope is a staple of Bloody Urban's art style- most of the monster characters are fairly silly-looking while still retaining their spookiness. The titular character of Erma is the cutest little Stringy-Haired Ghost Girl you'll ever see . Awful Hospital has several of these. The main antagonist, Dr. Phage, is an enormous bacteriophage posing as a surgeon, with a clueless attitude that makes people adore him, and a love of ducks. A dried, human-sized blood stain found on hospital sheets is also quite endearing, due in large part to a scene with a cupcake . Paranatural has plenty of spirits that are a mix of creepy and cute. Though special mention goes to P.J., the ghost boy that idolizes Max's "hero lifestyle" and hopes to be a hero himself. It's been so long since he last smiled that his smile ends up being rather disturbing. Out-of-Placers has Yannit the Indrel, who looks like a humanoid ant-mantis-thing and still manages to be totally adorable . The Doomy Adventures Of Irken Doominess: has two psychopathic female Irkens named Gar and Melissa who are insanely creepy, yet quite adorable. Many of Doctor Steel's toys (the Buzzsaw Baby, Psycho Sally, Polly Pukes-A-Lot, the Rabies Babies line, etc.) fall into this category. "Horror Movie Daycare," by CollegeHumor, is a daycare centre for every child, no matter how eldritch, demon-inhabited or undead. For story-time their minder reads from the Necronomicon. "Reagan - Reagan, stop, you're going to make yourself dizzy." Many people consider the Creepy Doll from LoadingReadyRun to be very cute, and also psychologically creepy. While he'd appeared in previous videos, it was when he showed up in "The Arms Race" that people really started to like him. Then, when Harry, the giant Creepy Doll, later appeared to torment Graham, both factors leaped up significantly. Harry's cuteness is also a factor of him being significant in Desert Bus for Hope, since he was an adorable friend for crew to hang out with during the marathon. Harry's Distaff Counterpart Harriet ends up slightly on the cuter end of the spectrum than the creepy end. Though, both are extremely creepy in this Crapshot. Pretty much all of the SCP children from the SCP Foundation, such as SCP-053, SCP-239 and SCP-134. Crowd from Deviant is a severely age regressed young adult with the maturity of a 9 year old. Despite this, she's a vigilante. As one would expect, this leads to a weird mix of adorable and terrifying, especially with her fondness for grenades. Changelings are shape-shifting Emotion Eaters that look like pony-shaped Big Creepy-Crawlies...and they're absolutely adorable, complete with Cute Little Fangs. So much so that the colorful "ascended changelings" that appear after To Where And Back Again that lack most of said creepy crawly attributes are less cute. Flutterbat from the episode "Bats!" Pinkie Pie's straight-haired, unstable, alter ego (dubbed "Pinkamena" by fans) is as huggable as she is disturbing. It helps that she's The Woobie by nature, since Pinkie only turns into her when she's very depressed. The Sphinx from Daring Done? is aggressive, villainous, giant, and has sharp yellowed teeth and slit eyes. Yeah, it's just not possible to make a half-cat half-pony anything less than adorable, particularly in the show's cute art style, and especially when fan artists started playing up her feline attributes . The new design for Imp in She-Ra and the Princesses of Power sacrifices the more animalistic features of the original in favor or more human looking ones. The result is something akin to a blue skinned, bat-winged demon baby with blank eyes. He looks like he should be right in the Uncanny Valley, up until you see him start to interact with Hordak and behave a bit like a Right-Hand Cat. Breach from Generator Rex. A pale teenager with a school uniform, two sets of arms (With two of them being bigger than they should), and a train of thought that makes her creepily endearing (One episode has her send Rex to another dimension to make him part of her "dollhouse"). But has a childlike attitude, suffers from an incredible case of When She Smiles and all in all is just a lonely kid trying to make friends (Not so effectively mind you, but still). Changing sides also helps. GIR and the titular Invader from Invader Zim. Gaz's bedroom is also filled with stuffed animals, dolls, and other paraphernalia that fits this description. Codename: Kids Next Door once featured a swarm of giant, hair-eating lice attacking the heroes' treehouse. Said lice were brightly colored and had rather expressive bug-eyes. Near the end of the episode, Numbah Two is covered in baby lice. The ginger kids from South Park all have eerie smiles and alabaster skin, but they take so much abuse before being drafted by Cartman into forming a hate group that you can't help but feel sorry for them. The ants from the Tales from the Cryptkeeper episode Nature, despite being drawn quite accurate to real life and seen up-close and personal from the perspective of two shrunken brothers, end up being really cute since they're The Woobies of the episode who spend the whole episode protecting and caring for said brothers while struggling just to survive and get some food for the nest. Ditzy from The Crumpets. A sweet girl whose balloon-like head regularly comes off, and her body can move headlessly. The creature in this ◊ sleep paralysis image. Kent J. Starrett is known for this, as it's part of his Signature Style. The Skull Kingdom in the Cool Kids Table game Here We Gooooo!. Naturally it's covered in skulls and bones, but they're designed very cutely. Millipedes. Long, slithery bodies and thousands of legs, yet so freaking adorable. It also helps that they're friendly and docile creatures to the point that some people keep them as pets.